Video poker is a popular game that draws its inspiration from poker and is played in a slightly different setting and format. 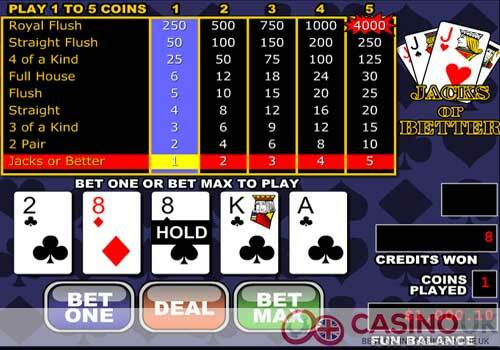 The game is based on five-card poker actually and is available for play at online casinos across the world. The game is easy to learn and a lot of fun to play. At some of the online casinos it is available in download mode while in many others it is available in instant play mode, which means you can just log in to your account at the casino and click the game of your choice to start playing. Allows you to practice the game till you are aware of how it works. Gives you the feel of playing the game at an online casino without spending any money. Allows you to go through the paytable and familiarize yourself with the amount you can win with different hands. Basic Elements in an Online Video Poker Game when you play for real money. Video poker is considered one of the simplest casino games to learn and play and provides the best chances of winning in terms of odds. Video poker, along with blackjack, is the two favourite casino games to be enjoyed by players, as it offers the most entertainment in land-based casinos as well as online. There are thousands of video poker machines in gambling establishments across the globe and hundreds of variations available online. In this guide, we will cover the history of video poker, look at the rise of video poker online, how video poker works, solve a few random number generator myths and explain how to play video poker. We also will look at the different video poker hands rankings, provide tips and strategies, and answer frequently asked questions surrounding the game of video poker. The first time one saw a game of video poker was towards the middle of the 1970s. The games were primitive compared to the games you have today but was still different from anything else that was there. The timing was good as well; that was when the personal computer was making an appearance. The game was introduced as Draw Poker in 1979 by Si Redd’s Coin Machines or SIRCOMA, the company that later became one of the big names in online gaming, International Game Technology or IGT. The popularity of the game rose and soon it found its way to the casinos of Las Vegas. From there, the journey was on and now you find them in almost every online casino that uses software from a reputed casino software provider. To understand the history and development of video poker, we first have to start with the predecessors of the game. The history of video poker stretches back much further than the first video poker machine. It stretched back to the beginning of card games and started evolving from saloons and river boats during the 1800’s. In 1891, a New York-based company, known as Sittman and Pitt, invented a poker machine that featured five reels or drums as they called it back in the day. Every drum contained ten playing card images, and a player simply had to insert a coin or nickel, and pull the lever on the side of the machine. Each drum was then set in motion and would eventually come to a standstill on a playing card image, making a final poker hand. Two cards were removed in order to reduce the chances of a player getting a royal flush. This includes the jack of hearts and a ten of spades, reducing the chances of getting a royal flush in half. In 1898, a man by the name of Charles Fey, commonly referred to as the father of slot machines, invented the ‘Liberty Bell’ slot machine and the ‘Card Bell’ poker machine. The Card Bell was a ground-breaking invention that was able to pay out 20 coins when a player had a royal flush. In 1901, Charles Fey invented the ‘Skill Draw’ poker machine that introduced a hold feature, allowing players to improve their poker hand by holding one or more of the playing cards while a re-spin was initiated without the need to insert additional funds. This was essentially the first five card draw poker machine. During the early 1900’s, the New York-based company, Sittman, and Pitt, also manufactured draw poker machines as poker was the most preferred card game at the time. The introduction of the hold feature allowed players to feel that they were more in control of the game as opposed to slot machines where you were playing on blind luck. The demand for these poker machines were in such high demand that the two companies could barely keep up. They were located in nearly every tobacco shop and liquor store across the United States. Since gambling was illegal in most of the country during that time, winning hands were paid off in cigarettes, cigars, and drinks. In 1970, a company by the name of Dale Electronics introduced the first true video poker machine to the world known as the ‘Poker-Matic.’ This video poker machine was introduced to virtually every single land-based casino in Las Vegas, and although it did not become an instant hit, it provided the groundwork for future video poker games to capture the public’s interest and money. During the mid-1970’s, Si Redd, a distributor for Bally, promoted a brand-new game to the executives of Bally and named the game ‘Video Poker.’ The idea was rejected by Bally as they refused to branch out from their core slot machine business, making it one of the biggest mistakes by the Chicago-based company. Bally did, however, agree to let Si Redd take the patent on a new machine and within months he signed a deal with the Fortune Coin company in Reno, Nevada. They formed SIRCOMA, or Si Redd’s Coin Machines, and started mass production on his video poker machines. Interest grew slowly on this new game, but in 1981 it was considered one of the most popular additions to land-based casinos. The early version of Si’s video poker machine required players to form at least two pairs to make a winning hand. This configuration did not garner much enthusiasm amongst players until the lowest winning hand was upgraded to a pair of jacks or better. The original versions of the game were extremely primitive and resembled televisions of the era. Si Redd managed to take the company public and also renamed it International Gaming Technology (IGT), becoming a major player in the land-based and online gaming industry. The final chapter in the history of video poker is the online version. The introduction of the internet during the mid-90’s was a perfect fit for video poker as the game was already reliant on advanced technology where players had to play against a machine. In 1994, a world leading software provider known as Microgaming developed the very first online casino software and wasted no time in introducing video poker to its players when it made its debut on the internet. With the internet growing at a rapid pace during the 90’s as more and more people had Internet connections from home, the more video poker grew in popularity as it could be played from anywhere in the world, at any given time. This also marked the beginning of the next chapter in the historical journey of video poker. Over the past two decades, online video poker became increasingly sophisticated as the quality of animations and graphics grew exponentially along with high-quality sound effects finally becoming a major feature in video poker. Several online software developers also went a step further by introducing numerous video poker features that you won’t find in any land-based casino. For example, players can enjoy a multi-hand video poker variation that is only available online and takes advantage of bonuses and free money that land-based casinos don’t feel obligated to do. Having discussed the history of video poker machines, we will now spend some time discussing the only component that turns video poker into a skill required game. At the centre of any video poker machine is a random number generator or RNG for short. A random number generator is a software algorithm utilised to ensure a random outcome while you play. Players with insufficient knowledge believe that the RNG simply shuffles virtual cards, but is actually generates a combination of numbers on a constant basis within a predetermined range. If we look at the Jacks or Better video poker game, all 52 playing cards included in the deck will have a corresponding number ranging from 1 to 52. When a player deposits funds or presses the Bet or Max Bet button, the microprocessor in the video poker machine will collect five random numbers in a fraction of a second and will translate them into playing card images. The player will then receive his hand, and the game can begin. The first five playing cards are dealt in the same manner on all video poker machines. However, different video poker machines will generate replacements for the playing cards the player wishes to remove in a different manner. 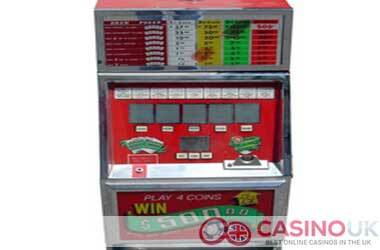 Video poker machines that were manufactured prior to the mid-1980’s utilise a parallel method of dealing. These video poker machines simultaneously selected the five cards for the initial draw and the five cards for the replacement draw. Each replacement card was linked to one of the cards forming the initial hand and was also lined up behind it. There were loads of players who didn’t accept parallel dealing, as the required card could have been behind a card they kept, thus, never receiving the card they needed to form a winning hand. During the 1990’s, a new version of video poker machines was introduced using a serial dealing method. Once the video poker machine dealt the first five playing cards, it also selected five replacement cards that were stacked sequentially. Regardless of the card the player wanted to get rid of, the first replacement card in the sequence would have been displayed. If the player decided to get rid of three cards, the first three replacement cards in the sequence would have been displayed. There is also another method that was introduced in the dealing of playing cards, known as five and five dealing. This method ensured the video poker machine didn’t choose the replacement cards when the original cards were dealt. After the initial deal, the random number generator will continue to produce combinations of numbers, and only when the player decided on the cards he/she wants to keep will the random number generator choose the replacement cards. There are several myths surrounding the operation of a random number generator. Inexperienced players might be intrigued by them or can also be influenced by them when making a playing decision on video poker. Therefore, I want to go through some of these myths and also offer reasonable explanations to remove any doubt you might have with regards to random number generators. Once a particular card is removed from the initial draw, the video poker machine will sometimes deal the exact same card on the replacement draw. This is incorrect. Once a player decides to get rid of a card, the card will be removed for the remainder of the current game. It is possible that the player will receive a card of the same rank. For instance, a player will decide to discard Ten of Hearts and receive Ten of Diamonds. Video poker machines have been programmed to operate in cycles of losses and wins, or strings of wins followed by strings of bad hands. There is no video poker machine that is programmed to operate in cycles. The random number generator has an algorithm that selects the cards for the original draw and the replacement draw at random. There is no pattern that can be formed as the previous hand dealt must be statistically independent of the next dealt hand. It is ludicrous to think there is a link between how much you bet and the cards that will be dealt for your particular bet. Regardless of your wager, the random number generator will generate a random hand of playing cards. Playing video poker is easy. All you need to do is go through the following steps and you are ready! Sign up or with an online casinos offering video poker and deposit funds into your account. Ensure there are funds in it. Choose the video poker game you want to play. The maximum number of coins using the Bet Max button. Click the Deal button. You are dealt 5 cards at random. Now, decide if you want to keep any of these cards with you. Click the cards you want to keep to ‘Hold’ them. The remaining cards are now discarded and you are asked to deal again. When you deal again you get fresh cards. The overall hand value determines whether you won or lost. Check the payout table to figure out how much your hand has won. 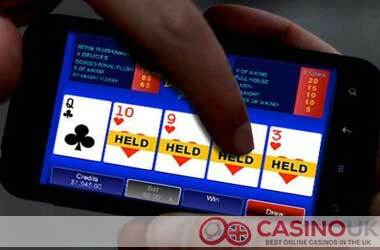 How to Play Video Poker for Real money in UK online casino sites? 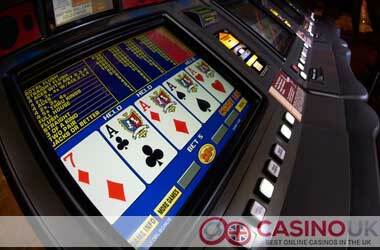 Almost all video poker machines, land-based or online, are variations of five-card draw poker. There have been several attempts made to introduce video poker machines based around seven-card stud, and a couple of video poker machines based around five-card stud that are currently in use. However, five-card draw remains the basic game with Jacks or Better being the game that most varieties are based on. There is no player hand or dealer hand to beat in video poker, and payoffs are made according to a pay table that can be viewed on the screen on most land-based video poker machines or on a meter that is displayed on a video screen. The lowest paying hand is a pair of Jacks or better, including a pair of Queens, Kings, or even Aces. Video poker offers an element of skill that slot machines don’t have. Players can make decisions that affect the overall outcome, and because playing cards are required to be dealt from a deck of 52 randomly shuffled playing cards, or 53 playing cards, if playing Joker’s Wild, the optimal strategy can be devised and the frequency of combinations can be calculated. It’s interesting to know that when riverboats opened under the new law that forbade games of chance, they were allowed to offer video poker as a game of skill, even though slots that were seen as a game of chance were not allowed until the law changed. 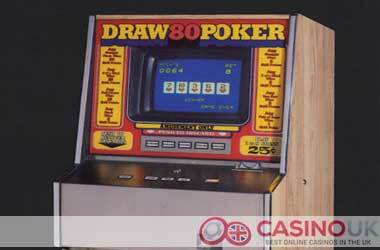 Playing the best video poker machines, skilfully, will offer odds that can rival any table game. Jacks of Better, the basic video poker game, in it’s full-pay version will return 99.5% with optimal pay over the long-term. Other video poker machines such as Deuces Wild will even offer a positive expectation over the long-term which means they will return more than 100% along with optimal play. Casinos offer these types of odds because they are well aware that only a handful of players understand the basics of proper play. One of the most important things for you to learn when you are looking to play is that each winning hand that you could possibly get has a different value. Before that you must know that there are high cards and low cards. The minimum value of a high card is the Jack. All cards with a value lower than a Jack are called low cards. High value hand: A hand with at least one high card is called a high value hand. Be careful which cards you end up holding. Low value hand: A hand where all cards are low cards is called a low value hand. This hand usually does not get you a winner; so you have to be careful which cards you want to hold, if any. The other option is to release all the cards and look at a fresh hand. Pairs: A hand that has at least a pair of cards of the same value; e.g. a pair of 9s. Jacks or Better: A hand that has at least a pair of Jacks. 2 Pair: A hand that has at least 2 pairs of cards of the same values, e.g. a pair of 2s and a pair of 5s. 3 of a Kind: A hand that has 3 cards of the same value, e.g. three 8s. Straight: A hand with 5 cards of consecutive values but from different suits, e.g. 6 of Hearts, 7 of Hearts, 8 of Clubs, 9, of Spades, and 10 of Diamonds. Flush: A hand with 5 non-consecutive cards from the same suit, e.g. 3, 8, 9, J, and K of Diamonds. Full House: A hand with a 3 of a kind and a pair, e.g. trio of Qs and a pair of 8s. 4 of a Kind: A hand that has 4 cards of the same value, e.g. four 5s and a King. Straight Flush: A hand with 5 cards of consecutive value from the same suit, e.g. 3, 4, 5, 6, and 7 of Hearts. Royal Flush: This is the highest paying hand in video poker. The hand has 5 consecutive cards from 10 to Ace from the same suit, e.g., 10, J, Q, K, and Ace of Spades. Royal Flush: This is the most powerful hand you can get in video poker and is a five-card hand consisting of A-K-Q-J-10 of the same suit. An example of a Royal Flush could be 10-J-Q-K-A of diamonds. This hand pays out between 200 to 300 times your total bet size. It’s worth mentioning that all video poker machines provide a bonus for displaying a royal flush when betting the maximum amount of coins. The odds of getting a royal flush on the first draw is 1 in 649,740 hands. Straight Flush: This is the second-best hand you can get in video poker consisting of five sequential cards of the same suit. Keep in mind, however, that this does not include A-K-Q-J-10 that forms a royal flush. A straight flush example could be 6-5-4-3-2 of diamonds. A straight flush usually provides a payout of between 50 to 60 times your total bet size. The odds of getting a straight flush on the first draw is 1 in 72,000 hands. Four of a Kind: This is the third best hand you can get in video poker and consists of four cards with the same denomination. A Four of a Kind example could be K-K-K-K-8. A Four of a Kind usually provides a payout of between 20 to 30 times your total bet. The odds of getting a Four of a Kind on the first draw is 1 in 4,000 hands. Full House: This is the fourth best hand you can get in video poker and consists of three cards of the same denomination and another two cards of the same denomination. A Full House example could be 8-8-8-5-5. A Full House usually provides a payout of between 5 to 9 times your total bet. The odds of getting a Full House on the first draw is 1 in 700 hands. Flush: This is the fifth best hand you can get in video poker and consists of five non-sequential cards that need to be of the same suit. A Flush example could be 4-7-8-9-K of diamonds. A Flush usually provides a payout of between 4 to 6 times your total bet size. The odds of getting a Flush on the first draw is 1 in 500 hands. Straight: This is the sixth best hand you can get in video poker and consists of five sequential cards that can be in a variety of suits. A Straight example could be 9-8-7-6-5 that are not suited. A Straight usually provides a payout of between 3 to 4 times your total bet size. The odds of getting a Straight on the first draw is 1 in 256 hands. Three of a Kind: This is the seventh best hand you can get in video poker and consists of three cards with the same demonization. A Three of a Kind example could be 8-8-8-Q-3. A Three of a Kind usually pays out three times your total bet. The odds of getting a Three of a Kind on the first draw is 1 in 50 hands. Two Pair: This is the eighth best hand you can get in video poker and consists of two pairs of different cards. A Two Pair example could be 8-8-5-5-A. A Two Pair normally pays out two times your total bet size. The odds of getting a Two Pair on the first draw is 1 in 20 hands. Pair: This is the ninth bets hand you can get in video poker and consists of two of the same cards. A Pair example could be 8-8-Q-K-2. A Pair usually pays out 1x your total bet size. The odds of getting a Pair on the first draw is 1 in 2.3 hands. While video poker is a game that has a lot to do with luck, there are a few tips you can imbibe to help improve your chances of landing a winning hand. We list a few of them here. Go through the games: Make sure you go through the different games available before you select the game you want to play. Understanding the different aspects of the different games gives you an idea of what to expect. Check the RTP values: Check out the return to player (RTP) values of the different games. A game with a higher RTP value, e.g. 9-6 Jacks or Better with a RTP of 99.54%, may be a good bet because it means the casino has a very low chance of winning – 0.46%. Read the pay tables: Read the pay tables for the different games, or for the specific game you want to play. The pay tables give you an idea of the value of the different hands; that helps you strategize better when it comes to figuring out which cards to hold and which to discard. Learn the basics of a game: Whichever game you want to play, make sure you are familiar with the basics of the game and know how it works. One way of ensuring this is to play in practice or free play mode for a while, at least till you are comfortable. Think about the number of coins to play with: There are a number of games that allow you to play with more than one coin. Think of how many coins you want to play with. Playing with a single coin may be a good option but you must understand that this will give you low payouts. On the other hand, playing with the maximum coins can give you bigger wins. Think about the number of hands to play: This tip works for multi-hand games. Check out how many hands you want to play. If you are new it may help to play with a single hand. Or play with the maximum hands till you win a decent amount and then switch to a single hand if that suits you. Whatever you do, it has to be something that you are comfortable with and also something that ensures you do not lose all your money. 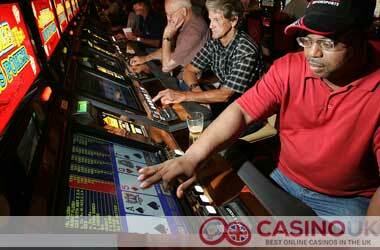 Manage your bankroll: Bankroll management is a vital aspect of video poker play. Think your way through how much you want to bet, for instance. And if you are losing, it may make sense to just move away for a while. It would be great if you could figure out a way. Play the games you are familiar with: It makes sense to not spread yourself across too many games. Play only the games that you are already familiar with and find easy. A full-pay video poker machine is one that provides the best possible odds. In the most basic online video poker game known as Jacks or Better, where you are required to get at least a pair of jacks in order to receive a payout successfully, you can view the payout table to determine if it pays out full. The key factor is to have a look at the payout for both a flush and a full house. A full house should always pay nine times your total bet amount, and the flush should always pay six times your total bet amount. These video poker machines are also referred to as 9/6 machines. Your odds of winning on these video poker games, while utilising the perfect strategy, are far better than any other casino game with a house edge lower than 1%. When playing maximum coins, you will get the full value when hitting a royal flush ranging between 200 and 300 times your total bet. Although it might not occur very often, it’s still beneficial when it comes around, paying out big. Let’s say you are playing Deuces Wild and you receive 6-6-4-4-7. What should you do? Do you hold both pairs or only one pair? Both choices are correct, but you will once again need to look at the pay table before making your decision. Some Deuces Wild pay tables pay 3 to 1 for a full house while other pay 4 to 1. Whenever you see a 3 to 1 payout on a Deuces Wild machine, you will hold one pair, and if you see it pays out 4 to 1, you will hold both pairs. It’s always wise to play for free, especially when you are new to video poker. It will give you time to understand how the game works and how the different poker hands pay out. Once you are comfortable with the game and you know exactly how everything works along with each poker hand strength, you can play for real money with the confidence that you’ll know what to do when a good hand is dealt. Do video poker pay tables ever change besides flushes and full houses? Yes, The Deuces Wild video poker game has several variations that can sometimes change the entire pay table. I couldn’t find a Jacks or Better variations that featured a 9/6 game but found a 9/5 game and an 8/6 game of Jacks or Better. Does it make a difference? The two Jacks or Better variations are almost identical. The 9/5 video poker game will return 98.44% while the 8/6 video poker game will return 98.39%. Are slot machines and video poker machines similar? In a lot of ways, slot machines and video poker machines are indeed the same. Both operate by adding money into a machine. A random number generator determines the result of the game, and on both games, the casino will measure profitability by a hold percentage. What will determine the payback percentage on video poker? The payback percentage is a function of the pay table on video poker games. For instance, the amount you receive in winnings on numerous hands is what will determine your mathematical expectation. The pay-out tables will vary from video poker game to video poker game, and some pay tables will be better than others. Can you get a positive house edge while playing video poker? In some instances, yes, you will be able to get an edge over a casino. It’s a rather small edge that is usually less than 1%. This mostly applies to progressive jackpot video poker games where the huge jackpot will offset your low odds of winning.